The year has just began, so I started my travel bucket list for the following months and I’m about to share it with you. Here are the best mainstream destinations, must visit cities in Europe 2014! Although I’ve traveled to some of these before, it’s always a pleasure to go back since there’s always a lot more to find out. I have a thing for traveling and although I prefer going to not so mainstream destinations because I love discovering new cultures, new places, meeting new people and it just has a different thrill than going to such mediated cities like Paris, you can not argue that these cities have became so popular due to the amazing experiences that they offer. Till then let’s get this Top 10 Must Visit Cities in Europe 2014 going! 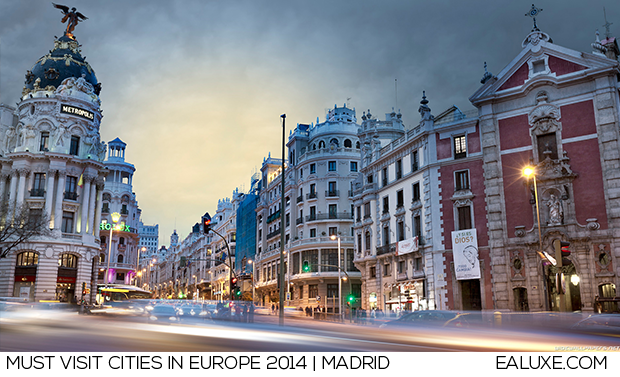 Art lover and haven’t already visit Madrid? You need to get that fixed asap! Home of some of the greatest masters in world history, you can enjoy masterpieces by Salvador Dali, Picasso, Miró, Monet, Rubens and the list goes on forever! Madrid is all about life, enjoying a walk down the monumental Gran Via and just taking everything in.